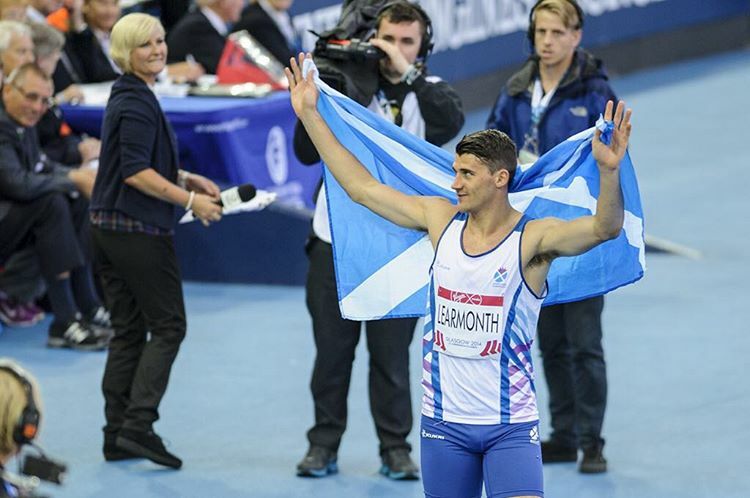 Set for what promised to be an amazing year in 2016, a heartbreaking hamstring injury during the heats of the Olympic trials in June saw Scottish 800m runner Guy Learmonth miss out on a trip to Rio. 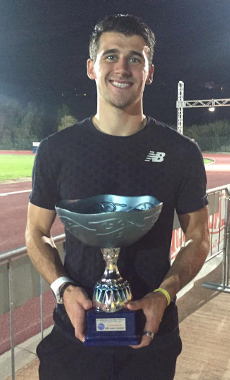 Following months of gruelling rehab, and through sheer hard work and determination, Guy returned to the track at the end of September and off minimal training picked up an end-of-season win in Boissano, Italy with a time of 1:48.14. 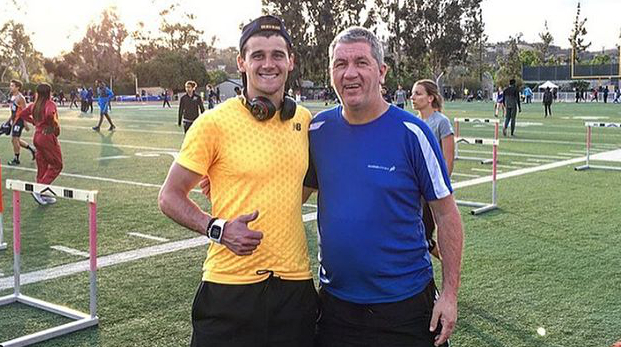 We caught up with the 23-year-old 800m specialist during a 10-day break from training. We spoke about the dreaded injury, plans for the future, racing David Rudisha and how crunchy peanut butter is just wrong. rb: Guy, first off, congratulations on your recent win. You must be pretty happy with that given the year you've had? gl: Well, it's a bit of a consolation at least! The time is pretty irrelevant. I'm just happy that I managed to get back into training, get fit and get back into the swing of things before the season ended. I just wanted something to keep me focussed. To get a bit of confidence going into the winter. I'll just have to make sure I get ready for the indoors now and be all guns blazing next season. rb: We don't want to dwell on it too much, but can you describe this year's injury to us? gl: I had a very slight strain in the hamstring about two weeks before the Olympic trials. With it being the trials I was always going to run and persevere regardless of any niggles. I was just hoping it'd be OK. Of course, the worst thing happened and in the final 100 metres of the heats the whole hamstring went. I qualified for the final, but was unable to run. It was just so frustrating to injure it at the worst possible time! rb: It must have been devastating. How did you cope? gl: At first I was really down in the dumps. I'm not going to lie, it was awful. The hardest time of any I've had to endure. Emotionally and psychologically it's been pretty horrific, but I've come out the other side and I'm ready to go again. rb: Were you able to run at all? gl: Not at all. It was about ten weeks with no running. Just lots of cross training and rehab to try and keep fit. Lots of cycling, swimming, all that sort of stuff. Anything to try and get the heart and lungs working and maintain some level of fitness. I've been doing a lot of work with the Scottish Institute and my physio up in Edinburgh. We've been doing a full strength and conditioning program this year and have a full winter program planned to fix a lot of things, and to maybe fix my back entirely. Well, to make it better anyway, and hopefully help keep at bay any problems with my glutes and hamstrings. But I can't just put it to bed now and think “Oh, I'm running again, let's forget everything else”. It's an ongoing process and just a part of my daily routine. I suppose it's more "prehab" than "rehab" now. rb: So you must be really happy with your result if it's after only a few weeks' training? gl: Yeah, definitely. In terms of actual running training I've not done an awful lot. It's just highlighted to me the power and importance of cross training. And that if you do get injured then you mustn't neglect everything and sit with your feet up and get fat. It can be a vicious cycle. I got that way myself for a couple of weeks, and then I managed to sort myself out. It's been hard keeping focussed but it really brought out my true character. rb: And was the hamstring feeling OK after the race? gl: Yes, everything's fine thankfully. All good. Body's all good. There's no wee injuries and there's no wee side effects. So fingers crossed. I've got an easy ten days now with no running at all. I'm just going to relax a wee bit, be with my family and just enjoy myself. Then I'll get straight back into it. Hopefully the body'll be ready for a gruelling winter's work. The hamstring should be totally fine anyway. Mainly I'm glad I'm not going into the winter injured or having done nothing. The race in Boissano gave me a bit of confidence and I'm ready to get my head down again now. rb: Things were going really well before the injury happened, weren't they? gl: Yeah, it was going great. I was actually surprising myself with the sessions I was doing. Dare I say it... it wouldn't have surprised me this year if I had run 1:44. I was thinking if I could get down to 1:45 and then get a big race it wouldn't surprise me if I could go even quicker. gl: Ha ha! Yeah, if I do it don't be surprised. rb: So what are the plans now? I know you're a keen indoor racer, but do you periodise your training and get in higher mileage over the winter? gl: I do naturally try to have a bigger mileage in the winter. I think this year the endurance is a focus. The speed's never been a problem. I think I could do no speed work for months and months then hit one or two sessions and probably hit times that it would take others months to get to. I have neglected endurance a little in the past and I think that'll change this year. I'm back home now with my coach Henry Gray. I never really left him, but while in Loughborough he was on the sidelines a wee bit and other guys were taking a bit more control, but I'm back with Henry properly now. I'd usually be at around 40-50 miles a week and we're going to try and push it up towards 60-70 miles a week if we can, while still trying to keep a bit of a speed element in there. It's about trying to find the right balance. rb: A solid winter of training should put you in a perfect place for what must surely be the big goal next year: the World Champs. Are you going to have a good crack at an indoor season or focus purely on training? gl: At this time last year I did weigh up not having an indoor season in 2017 and just really focussing on the outdoors. But because of being injured I missed the bulk of the summer season, and all the goals I had went out the window. I don't think I can wait until next outdoor season to target them. I'd like to have a full indoor season and make up for missing out this summer and I'll worry about the outdoors and the World Champs come April/May time. But right now I'm focussing on the indoors and obviously qualifying for the European indoors with the goal of bettering my performance from last year. I was 6th in Prague in 2015 and I would love to medal or get back in those finals and get back up there again. rb: And that was off the back of being British Champ in 2015. Are you feeling confident for that again this year? gl: Yeah, I've made a lot of changes this year and having come back home it's going to come to fruition I think. Things are going to come together quite quickly now. I only finished third at the British indoors last year, and I need to go and get my title back this year. So I'll start working towards that. I also want to start picking up all these gold medals again, running some big PBs and getting my name out there on the world stage. But I do need to work on endurance at the same time. rb: It used to be very common for athletes to double up in the 800 and 1500 but they seem to be much more specialist events now. gl: Yep, it's a lot more specific now, with more bespoke training needed. And the 800 especially is a really difficult event to get right. There are so many different elements to train for. rb: But that's the fun of it, surely? Hard to train for and hard to race. Everything's just hard about it. gl: Exactly! It's exciting. Oh, it's the worst event. And I'm not being biased there. It's the worst event to train for and it hurts like hell. We're all sick in the head in our own unique ways and we like to push ourselves to the limit. For whatever reason we all say it's the hardest event. I'm sure every event is tough, but maybe I will be biased and say it's the hardest of the lot. rb: Even harder than the 1500? We noticed you having a go in 2013. How did that work out? gl: I do come from a speed background and I was a bit worried about the 1500. I think if I trained properly for it I could do a good one, but it doesn't appeal to me at all. My PB is 3:45 and I think I could manage maybe around 3:40. Maybe below, but that would require a serious endurance effort. I do think in the long run I'd need to get down to that if I wanted to be world-class in the 800. The PB was off the back of a big altitude camp in Fort Romeu in 2013. I came straight down and ran three rounds of 1500s and I think I ran OK. But it's less than four laps and I was actually counting them down. If I'm counting down the laps in a 1500 maybe it's not the distance for me! It says it all. rb: We won't see you in the London Marathon any time soon then? gl: Ha ha. No! Maybe when I'm retired I'll do it for a bit of fun. It was a different type of pain the 1500. In the 400 and 800 it's more about lactic acid. When it hits it hits. But the 1500 was more like a slow dying pain. It was weird. The pace was slow through 800, but that third lap was horrible. My legs were like lead. I went through 800 in 2:01 or something and it felt easy, but on the third lap it was so hard. rb: And how about the 400? Your current PB is 48 flat. Would you like to improve on that as a step towards perfecting the 800? gl: Well, I did a 47.3 in training, but of course that doesn't count. I think to improve I'd basically have to do more specific 400 metre training. I do a lot of speed endurance and quick stuff, but in terms of actual specific work for the 400 metres, I very rarely do any. I'll do maybe two or three sessions a year if I'm lucky. I think to get down to 46 would involve doing a couple more sessions. He's run 20.7 for 200 and was 7th at the World Junior Championships this year, so he's seriously quick. When I train with him and do some shorter stuff it's amazing. I think maybe doing a few more sessions with Tindle and a few of the sprinters and I could really chop my 400 time down. I think if I had a full speed endurance phase for the 800 and then a final few weeks of some 400 work I'd run a very good time. 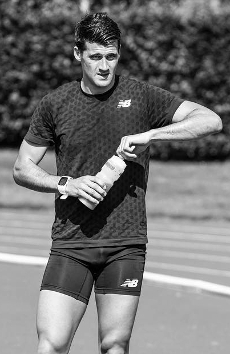 I'm not wanting to break any world records with the 400, so I don't want to get carried away with it and forget that it's to complement the 800. It's finding the balance of course. You can't focus on one or the other too much as an 800 metre runner. rb: But if you do pull down the 1500 and 400 times they'll pull the 800 time down with them? gl: Yeah, exactly. It's trying to find the balance. I don't want to do massive blocks of everything and just do pure endurance here or pure speed here. For me it's trying to find the balance across the board. Just a little bit of endurance here, a little bit of speed here, a little bit of speed endurance there and trying to find that perfect blend. I'm going to sit down with Henry this year and devise the training program. I've done a lot of different programs and I think I know what works now. rb: Thinking about the different types of 800 metre runners, do you consider who's in a race with you? Analyse their tactics? gl: I do to a certain degree. I quickly assess strengths and weaknesses, but try not to get bogged down in it. The coach and I might have a wee chat about it the night before. “Be careful with so-and-so”, stuff like that. In boxing or a sport like that you can study and get to know your opponent inside out, but in athletics there are different faces every week. You have to have a game plan that works for you, have faith that it's going to work, believe in yourself and stick with it. You can't control what anyone else's training has been like or what their approach is. You can only control what you do. You have to be wary and race smart and not play into others' hands, but if you run your own race you'll have your best performance anyway. rb: Let's go back in time a bit. I know you used to play rugby and started specialising in athletics a bit later. How did it all begin? gl: Well, I always used to run in the summer, but just for enjoyment. My mum and dad encouraged us to do whatever we wanted and really supported us. Driving us around, that sort of thing. Where I come from there's a massive rugby culture and my big brother, who's a couple of years older than me, is rugby-mad. So, I suppose like any younger sibling I wanted to be like him and copy him. I started playing rugby at a very young age; about 4 or 5 years old I think. I was always running though and joined my first running club – Dunbar - at about 11 or 12. I just ran and enjoyed it. I tried 100s, 200s, 800s. I even tried the javelin, but quickly realised that field events weren't going to be my forté. gl: Definitely! And after that things started picking up again with the rugby. I was part of the district teams with the Border Reivers for the U15, U16 and U17 teams and then I got selected for the Scotland Development Squad for U17s for the Junior Six Nations. I remember playing rugby on the Saturday doing the Scotland trials and then on the Sunday travelling to Glasgow and winning my first national title in the 400 metres. And I thought to myself, if after a full game of rugby in the freezing cold the day before, and without any running training, I can do that, what could I do if I did train for it? Then the rugby training slipped a bit. The Scotland selectors were trying to get me in the gym five times a week and trying to bulk me up and to get me to put everything into rugby. They got worried when I wasn't doing that and left me out of the Six Nations U17 squad. So I thought, “That's it, the decision's been made. I'll go for it. 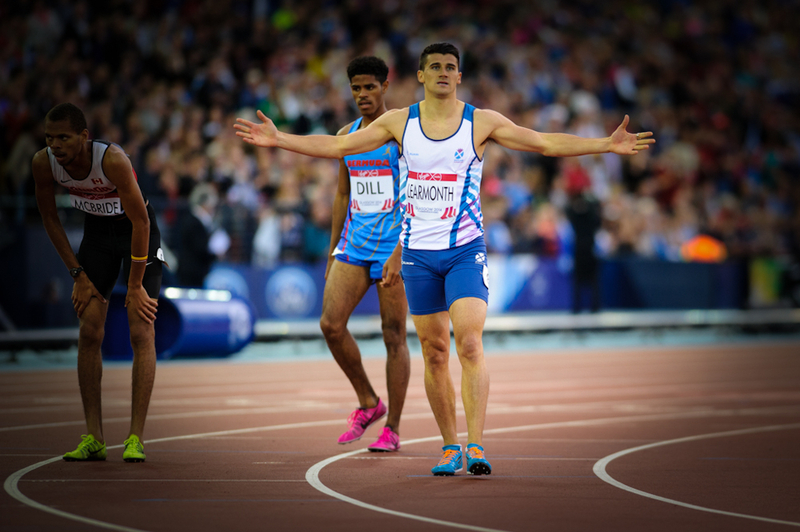 Go down the athletics route.” And the next year – I was 17 – I had my first proper winter of training and that year I broke five Scottish U20 records. That was the start of it all and I've not looked back. rb: You can't ignore those sort of results I suppose? gl: Absolutely. I thought to myself, this is what I've got to do. My destiny I guess. rb: Are you still interested in rugby? gl: Absolutely. I still follow rugby and my brothers still play. 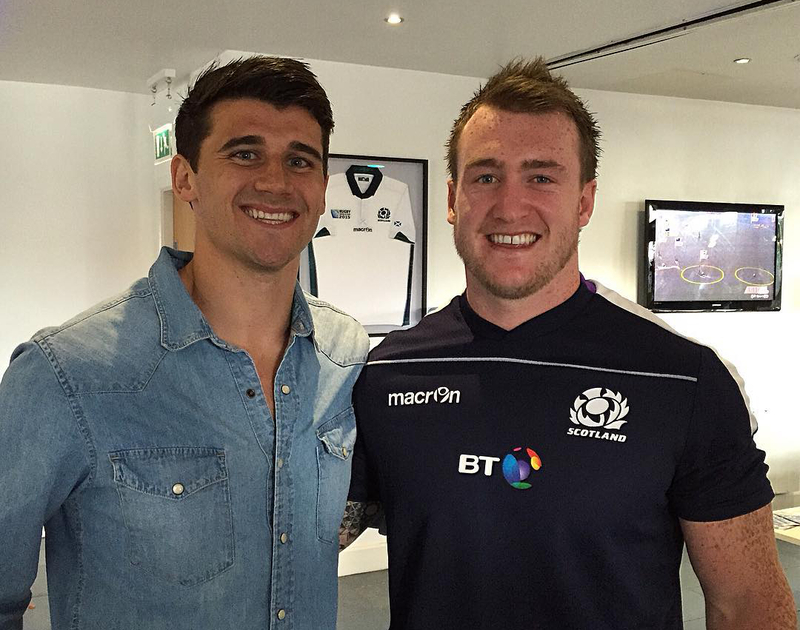 Also, one of my best friends, Stuart Hogg, regularly features in the Scotland team and the British Lions as full-back. I live out my rugby career through them now and I'm happy doing my athletics and not getting smashed to bits on the rugby pitch. rb: I suppose you can't even play for fun now given the injury risks? gl: Yeah, I can't do any other sport. I don't think the sponsor would be too happy if I called them saying I can't run this season because I broke my legs playing rugby with my mates. rb: It wouldn't look good. You're sponsored by New Balance, aren't you? Is that all going well? Your social media suggests so. 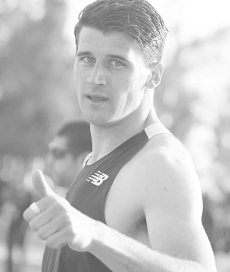 gl: Yeah, all going great with New Balance. I absolutely love them. They're just a great company to be a part of. The past couple of years you've started seeing them everywhere. New Balance UK have done such a great job. They're expanding and it's really great to be part of that company and I want to grow with them and do my part for them. It feels like a family with the marketing team and all the athletes they've signed. It's all very close-knit and just amazing to be a part of. I'm really grateful to them actually. It's enabled me to train harder. I just need to start pushing big times now. And I've got every intention of doing that. rb: We're sure you'll make them very proud. As long as you're not spotted on the rugby pitch! gl: No! However, I would like to maybe go back to it all after athletics. Although having been out of it so long I think if I did go back I'd have a couple of knocks then be out for two years with injury. I'd like to think I could maybe do the sevens where I had a bit more space to run away from everyone and could out-kick them. But with fifteen there are too many on the pitch. We'll wait and see, but right now I have no ambition to go back to the rugby and I want to take my running to the next level and do some big things in the athletics world. I'll happily follow both my brothers' rugby careers and my friend Stuart Hogg's, I'll happily play out my rugby career through them. rb: Would you wear odd socks to play rugby as well? gl: Ha! Yeah, everybody knows about the odd socks now. gl: It started back home. I've got two brothers and there's my dad. So it's four boys and my mum. Outnumbered! When we were all living back home and there was so much sport going on and so much washing, the machine was on 3-4 times a day and it got to the point where my mum was spending half the day pairing up socks. And after a while she said, “Stuff this, it's all going in a basket and you lot can sort it out yourselves.” So, we used to just go in and take out any two socks. Whatever you could get your hands on. Sometimes they were odd, sometimes they were matching. It stemmed from that. So, in all my races I'd unintentionally have odd socks on. Purely because of my mum's washing basket. It got to the point when people used to ask me if I had any superstitions, and I said, “Not really, but I have a similar routine and I tend to wear odd socks...” and that was it. So now, when I pack my bag I have to wear odd socks before any race. rb: Would it upset you horribly if you packed a matching pair of socks one day? gl: I think it would, to be honest. I can wear matching socks during the day and I can wear them to training and for the warm up. But as long as when I put my spikes on for the race I've got two odd socks on then I'm fine. rb: You weren't wearing matching socks when you got injured were you? gl: Heh, maybe I was... Nah, I wasn't. Imagine that! That would have really cemented the superstition. The other thing I do is have a peanut butter and jam sandwich before any race. About three hours before. That's the last thing I eat. gl: It has to be smooth peanut butter. You see, I have seeded bread, so if I had crunchy there'd just be too much going on. Wait, do you have seeded and crunchy peanut butter? gl: Crunchy peanut butter and seeded bread? It's like you're breaking some sort of law there! rb: I often sit down wearing matching socks and eating crunchy peanut butter on seeded bread! gl: Ha! Maybe I'll have to try it. rb: Final question then, and we pose this to everybody. If you could race against, and beat, any athlete from any era in any race. Who, when, where, what would it be? gl: I've raced Rudisha five times and he's beaten me five times. Obviously he is the greatest ever. He's the world record holder, he's the world champion and he's won two Olympic golds. I'm really lucky to be racing in the same era as him. I remember at the Commonwealth Games somebody was talking to me about coming up against Rudisha and I said I'd love to race him. Out of the ten heats or whatever it was, I'm the one that gets drawn with Rudisha, in the lane inside him, and I thought, “Great!”. I remember a few journalists texting me and saying “Careful what you wish for” and so on. I got him in the heats, semis and finals and obviously he beat me every time. I've been so lucky to race him. 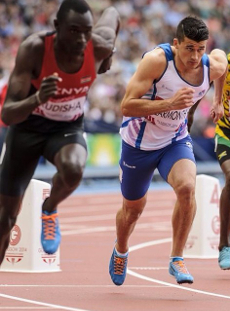 It's 5-0 now so I'd love to beat David Rudisha. Obviously Seb Coe's in there as well. I'd love to race Seb, but I'm going to have to choose Rudisha. rb: Time travel is allowed for this fantasy. Any particular races from the past you'd like to beat him in? gl: It's gotta be the London Olympics, hasn't it? rb: How does the race pan out? Are you leading from the front instead of him? gl: Oh no. He's a natural front runner, so I'll let him do all the work. Let him set a suicidal pace and then pip him on the line. gl: Ha ha! Go for it! Guy, it has been an absolute pleasure speaking to you. We'll keep a close eye on your achievements over the next year of which we're sure there'll be many. You can keep up with Guy on Twitter, facebook and instagram. He also has a blog.